It’s pancake day today. If you want to try something a bit different, here’s a video that shows you how to make Japanese-style pancakes called どら焼き (dorayaki). The voice-over is in Japanese, but the essential points are written in the English captions. Use L-size eggs, and ordinary plain flour — “weak” flour is a direct translation of 薄力粉, a term used to distinguish ordinary cake flour from the “strong” flour (強力粉) used in breadmaking. It looks like he’s using icing sugar in the video, but caster sugar should work fine. An authentic dorayaki is made from two of these pancakes with some red bean paste sandwiched between then. Your local Asian shop might have some. Alternatively, try maple syrup and ice cream. When Japanese is translated into English, the translated text generally occupies more space than the original. This can sometimes be a problem. For example, if you use a translation tool like OmegaT to perform an in-situ translation of a Japanese PowerPoint presentation, the English text is probably not going to fit properly. What you need is some sort of bulk text resizing tool. PowerPoint doesn’t allow you to perform operations on all the slides in a presentation, like scaling down the font size of every text box. (As far as I can tell, it only allows you to select multiple text boxes and set them all to the same font size, one slide at a time.) However, it does support AppleScript, which can do the job for you. The following script will adjust every text box in the entire presentation. It won’t do a perfect job because text boxes that contain text of different sizes will be resized to a single font size. However, it can save a lot of time when you have a large translated file with broken formatting. You can run this script direct from the AppleScript Editor application, but if you think you’re going to use it a lot then you would be better off saving it in the PowerPoint scripts folder (~/Library/Application Support/Microsoft/Office/PowerPoint Script Menu Items/), from where it can be directly accessed via PowerPoint’s scripting menu. The script below contains two variables that you can adjust to suit your needs: minFontSize (the font size below which no scaling takes place) and fontScaleFactor (the factor by which font sizes greater than minFontSize are scaled). Don’t forget to save a backup before running this script. There were two stories about Japanese technology in the news yesterday. One was about a remote control toilet. Yes, really. The Lixil Satis has a Bluetooth interface that can be accessed by installing an Android app on your smartphone. This allows you to control all sorts of functions, including opening/closing the lid, flushing the toilet, and operating the “wash/dry” system that seems to be a standard feature on Japanese toilets these days. But yesterday a security advisory for this contraption was published online. It turns out that its designers had cut corners by making it unnecessary to enter a four-digit PIN when pairing an Android device with the toilet. (More precisely, they hard-coded the PIN to ‘0000’.) 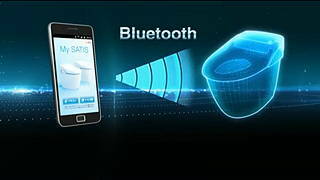 This means that anyone with an Android smartphone can control your toilet remotely, simply by downloading the free app. Oops. In space … you don’t actually need legs. The other story was that of Kirobo (キロボ), the talking robot that was dispatched to the International Space Station, supposedly to act as a companion to astronaut Koichi Wakata (若田 光一) who will be joining the ISS in November. I expect Kirobo will be staying in his box until then, as he only speaks Japanese. According to Kirobo’s developers, this exercise is part of a study to see how machines can lend emotional support to people isolated over long periods. I suspect it’s more of a marketing manoeuvre. After all, Wakata won’t be alone on the ISS. And I’m sure they have Skype up there. Cute little toy, though. 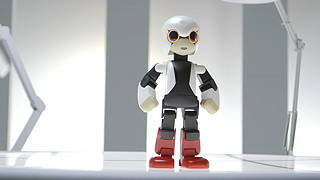 I expect Kirobo will be appearing in the shops any day now. Back in March I mentioned a domain registration scam originating from a Chinese domain called picweb.net. It looks like the scammers have now relocated to ygitech.com, which was re-registered just a few weeks ago. If you receive any emails that look like the following, then please ignore them. Their claims are completely bogus. Don’t visit their website either; their emails may simply be an enticement to visit their site so they can install malware on your computer. (Please forward this to your CEO, because this is urgent. Thanks)We are a Network Service Company which is the domain name registration center in Shanghai, China. On July 22, 2013, we received an application from Taisheng Limited requested “japanesetranslator” as their internet keyword and China (CN) domain names. But after checking it, we find this name conflict with your company name or trademark. In order to deal with this matter better, it’s necessary to send email to you and confirm whether this company is your distributor or business partner in China? This is a formal email. We are the auditing department of a professional domain name registration and dispute solution organization in China. Here I have something to confirm with you. We formally received an application on October 17, 2013 that a company claimed “MAX Holdings Ltd” were applying to register “japanesetranslator” as their Brand Name and some “japanesetranslator” Asian countries top-level domain names through our firm. Now we are handling this registration, and after our initial checking, we found the name were similar to your company’s, so we need to check with you whether your company has authorized that company to register these names. If you authorized this, we would finish the registration at once. If you did not authorize, please let us know within 7 workdays, so that we could handle this issue better. After the deadline we will unconditionally finish the registration for “MAX Holdings Ltd”. Looking forward to your prompt reply. The URL at the end of this email was actually displayed as a JPEG image instead of being typed at the end of the email. This is an old trick used by spammers to get past spam filters that trap links to blacklisted websites. Back in January I started noticing a lot of failed attempts to log into this website’s admin section, presumably in an attempt to hijack the website and use it to send spam, host illegal content or join some sort of botnet. It seems that many other websites are being affected in the same way. Researchers led by Professor Akio Namiki at Chiba University’s Namiki Lab have developed an air-hockey robot that can hold its own against human players. Although it’s not the first robot to play this game, it has the ability to change its strategy based on the playing style of its opponent. This translates roughly as “the one who spits fire with forceful menace” (or “one who spits out words in a fiery manner” according to the rest of the blogosphere). 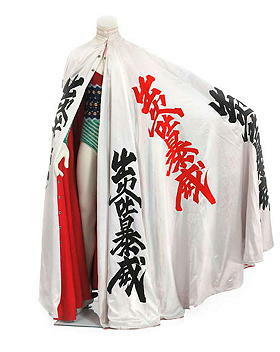 Regular visitors to this site are probably already aware that foreign names are normally written using the phonetic katakana syllabary, and not without good reason — kanji characters can usually be read in at least two different ways, so it’s almost impossible to achieve unambiguous results. For example, film director Yoshikazu Katō and human rights activist Giichi Nomura both share the same given name (義一) but with completely different pronunciations (Yoshikazu and Giichi). At least with Japanese names it’s usually possible to make an educated guess of the most likely pronunciation. But with foreign names and words, it’s much harder. This is precisely the sort of ambiguity that katakana was designed to eliminate. 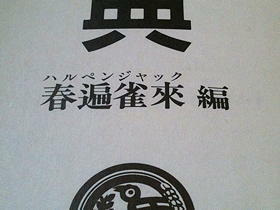 Katakana offers a better range of pronunciation. For example, デイヴィッド (deividdo) is much closer to the English pronunciation of “David” than debito. Unless you’re already well known, you’ll still have to explain to Japanese people how your name should be pronounced. 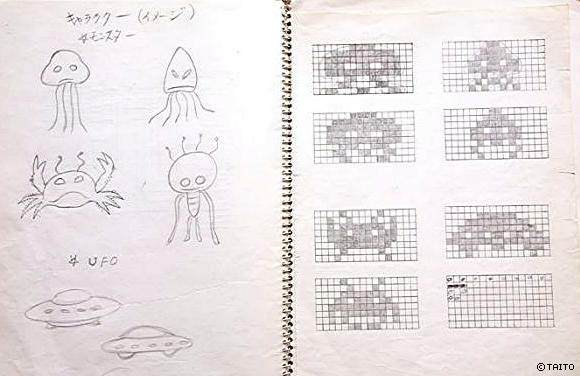 Space Invaders — the original “shoot-em-up” video game — was released thirty five years ago this month. The octopus came first, so I thought, maybe I should try a squid and a crab. But then they didn’t look very threatening, so I kept trying to come up with something else.